Arcane Revelry and dining experience platform, Feastly, are hosting a CBD-infused brunch series to celebrate a brand new Select CBD product on Saturday, November 11th from 11am to 2pm PT in Portland, Oregon. 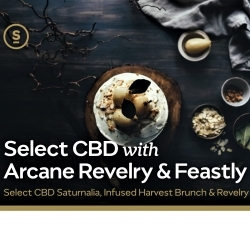 At Select CBD Saturnalia, Infused Harvest Brunch & Revelry, Select CBD will announce a new product in its line of essential oil infused, hemp-derived CBD. - Arcane Revelry has partnered with dining experience platform, Feastly, and national CBD brand, Select CBD, to host Feastly Portland’s first CBD-Infused Brunch Series on Saturday, November 11th from 11am to 2pm in Portland, Oregon. - At the event, Select CBD will announce and present a brand new hemp-derived, essential oil infused CBD product. - For a ticket price of $55, guests will indulge in a CBD-infused gourmet brunch with Select CBD, sip on CBD-infused cocktails, learn about the benefits of CBD and receive a brand new product from the Select CBD line.